Talk about giving a whole new meaning to the expression, having a blast in Niagara Falls. For six nights in November, visitors to the Honeymoon City can do just that with the first-ever staging of Cascades of Fire – a world-class fireworks event featuring top pyrotechnic teams from around the globe. It’s a first-time addition to the 36th annual Winter Festival of Lights, the three-month celebration when the entire tourist section in the city and around the falls is decorated with massive – and increasingly interactive – lighting displays. Cascades of Fire runs Nov. 9, 10 and 11 and Nov. 16, 17 and 18 and includes teams from Brazil, Finland, China, Italy, Vietnam and Canada. Each night, one of them will stage an 18-minute extravaganza of light and sound over the falls. 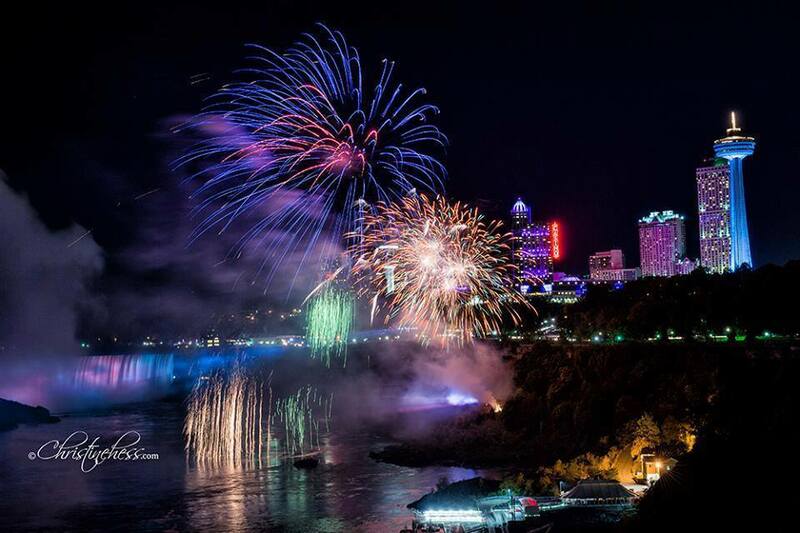 “So this is going to be so spectacular, something Niagara has never seen before,” said Festival of Lights executive director Tina Myers, in a recent interview with the Niagara Falls Review. And with three nights of the show on each weekend, it’s the ideal event to reserve a hotel room for and spend the weekend in Niagara Falls. The Holiday Inn By the Falls, is well positioned as a headquarters for this sort of event. Located at 5339 Murray St., it’s about two kilometres from the falls – a beautiful walk through the heart of Niagara Falls tourism (and just far enough away to provide a great view from your room). The Festival of Lights, sponsored by Ontario Power Generation, is known worldwide for the breathtaking views it affords of the lit night sky, featuring more than two million lights. Fireworks are scheduled for all the weekends of the Festival of Lights anyway, but Cascades of Fire – with its international flavour – is an especially once-in-a-lifetime experience. Here is the schedule – Nov. 9, China; Nov. 10 – Finland; Nov. 11 – Brazil; Nov. 16 – Vietnam; Nov. 17 – Italy; and Nov. 18, the grand finale, Canada. All shows start at 9 p.m. According to the judging criteria, 20 points each will be awarded for theme and choice of music; creativity; selection of effects and use within the display; synchronization to the music selection; and crowd reaction and appreciation. All the music for the shows will be played on radio station Star 102.5 FM. Awards will be presented by the mayor of Niagara Falls at the closing ceremony, following the Nov. 18 performance.